Families seeking luxury while on the go are sure to love the Roller Team Zefiro 690G. 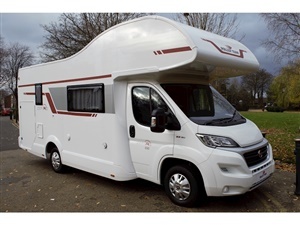 Designed with comfort at it's forefront, this spacious motorhome can comfortable sleep and feed up to 6 people at any given time. A converted over cab area frees up floor space during the day while concealed storage throughout allows the home to stay as stylish as possible - even on the longest of journeys. A large washroom and separate shower cubicle reducing time wasted while getting ready as well as offering privacy to every member of your party. With wooden panels and high-quality soft furnishings throughout, the 690G provides that home-from-home feeling with Hill Start Assist technology ensuring the smoothest of pull offs in any location.